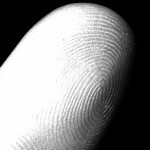 What are the most common fingerprint characteristics? 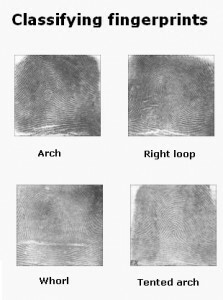 An arch is when the ridge of the fingerprint starts from one side of the fingerprint then goes to the other side without curving back. 2 types of arches can be documents. A Tent Arch is when the arch goes upward and looks like the top of a tent. A Plain Arch motions like waves. The loop pattern flows within the fingerprint when ridges start from one side, loops around and goes back to the same side it started from. There are 2 types of loops: the Ulnar Loop and the Radial Loop. These two different types of loops are distinguished by the direction that the loop is going. The Ulna Loop is when the direction of the loop is coming from the thumb, going to the little finger. The Radial Loop goes from the little finger towards the thumb. The whorl pattern comprises concentrated circles on the finger. There are 4 different types of whorl patterns; Plain Whorl, Central Pocket Loop Whorl, Double Loop Whorl, and the Accidental Whorl.